Well, it’s 2019. Hope you all have a happy and safe new year. A prosperous one would be nice, too! Chris is back from his usual Christmas Tassie trip to visit family, I’m back at work and things are pretty much back to normal. It’s been 34­°C or more every day since Christmas Day. That’s 12 days straight of crap sleeping conditions. The days have been so hot, Quinn has taken to sleeping it out. I mean, he’s a cat so he sleeps a lot anyway, but he’s been sleeping far more these past two weeks. And mostly inside, rather than outside. Above is a photo I took this morning about half five. 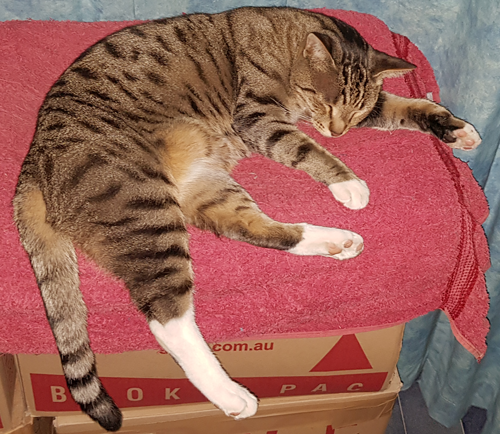 Note the sprawl and letting the legs dangle over the side, not the usual tight, trim little bundle of fur that is his normal sleeping pose. I’ve been amazed at how well I’ve handled the heat, although a few days ago it was so muggy I felt like I was back in Emerald during the wet season! But some nights have been really tough going. I consider anything above about 13°C to be too hot; single digits suits me fine. This afternoon a front moved through—at last—bringing some much needed showers and cooling things off considerably. Hopefully, that means tonight will be much better sleeping weather. It’s been almost two years since I last posted, so it’s time for a clean start. We’ve decided to abandon half the gardens and concentrate on the strawberries, beans, and tomatoes. We have a couple of tanks that collect water from the garage roof which I usually pipe into the house tanks, but that’s been diverted for use by the remaining veggies. If the pumpkins, peas and onions survive, then great. If not… <shrug>…what can you do without enough water? Our annual BBQ was held in December this year, and we had a small crowd of just the staunch regulars because of threatening weather, other year-end commitments, and so forth. As you know, I’m not much of a social butterfly, but it turned out to be a pretty good night, not least of which was because everyone left by about 9pm! An hour or two’s work to clean up the following day, and we were done! Anyhow, season’s greetings to all. More to come in the new year. Just A Dry Pond is all about letting people know what's happening down on the farm.